The Jordan XX8 Days of Flight continues with day 16, a look back at the Air Jordan XVI. "The XVI was the first Air Jordan to integrate a shroud. With magnetic clasps, this removable shroud gave one shoe two distinct identities. Patent leather, mesh inserts, and the mid-cut pay homage to past classics. Break out your ‘sixteens’ for Day 16 of XX8 Days Of Flight. 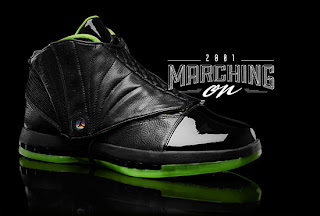 www.AJXX8.com"
Now twelve years after the Air Jordan XVI was originally released, the demand for them couldn't be higher. Many people believe it is time for an Air Jordan 16 Retro as it has been over 10 years since their debut. With a few recent 2012 Samples popping up online recently, one can only guess that the Air Jordan 16 Retro was either originally scheduled to be released in 2012 or, will be returning in the near future. While none are confirmed to release at this time, keep checking the 2013 Release Dates section, if information becomes available regarding an Air Jordan 16 Retro release I will be sure to let everyone know. For now, enjoy the images below of this sample black and volt green colorway of the Air Jordan XVI made exclusively to celebrate the Jordan XX8 Days Of Flight Collection. Be sure to check out my Twitter @ajordanxi and Instagram @ajordanxi as I have submitted pictures of some of my Air Jordan XVI collection to share with everyone. You can also see them on the ajordanxi.com official Facebook page here as well.